NEW YORK (Reuters) - Oil prices pulled back on Friday on concerns additional U.S. tariffs would be placed on Chinese imports, after an earlier rally triggered by worries that more sanctions on Iran might constrict supply. Crude futures ended the week up more than 1.6 percent. Traders said an early rally on Friday was sparked by reports U.S. Secretary of State Michael Pompeo was going to announce new sanctions on Iran. "It increases the odds that there will be less oil coming out of there," said Phil Flynn, an analyst at Price Futures Group. The gains were curbed though by reports U.S. President Donald Trump instructed aides to proceed with tariffs on about $200 billion more of Chinese products. Brent crude oil futures pulled back on the reports of additional tariffs, dropping 9 cents a barrel to settle at $78.09. The global benchmark fell 2.0 percent on Thursday after rising on Wednesday to its highest since May 22 at $80.13. 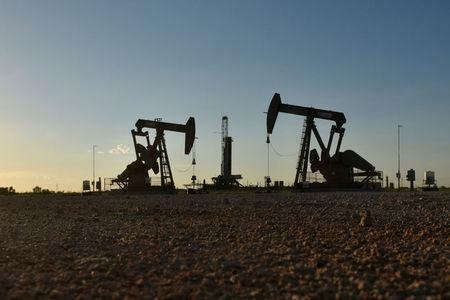 U.S. West Texas Intermediate (WTI) futures settled up 40 cents at $68.99 a barrel after dropping 2.5 percent on Thursday. After a volatile week, Brent was set for a 1.6 percent weekly rise and WTI 1.8 percent. Brent reached a session high of $78.94 a barrel, as speculators attempted to push the price above the $79.00 level. Brent crude futures have reached a high around $80.00 a barrel three times this year before pulling back. "The price action of yesterday confirms $80.00 a barrel as a strong resistance line in Brent," consultancy Petromatrix said in a research note. "There has been a lot of speculative interest searching for Brent above $80.00 a barrel on the back of the U.S. sanctions on buyers of Iranian crude oil, but so far this year any buying of Brent above $79.00 barrel did not have a long shelf life." U.S. energy companies this week added oil rigs for a second week in a row with crude prices trading near their highest since the summer of 2015 as major oil producing countries extended a global deal to limit supply. Drillers added two oil rigs in the week to Dec. 1, bringing the total count up to 749, the highest since September, General Electric Co's Baker Hughes energy services firm said in its closely followed report on Friday. Washington re-imposed some of the financial sanctions from Aug. 6, while those affecting Iran's petroleum sector will come into force from Nov. 4. Refiners in India, traditionally major buyers of Iranian crude, will cut their monthly loadings from Iran for September and October by nearly half from earlier this year.